1 Night Meno a Kwena Lodge a great first night in Botswana. Your guide for the duration of your safari will be there to welcome you on arrival at Maun Airport around noon. The exact departure time from Maun Airport will be advised closer to the time, as this depends on the commercial airlines flight schedules. 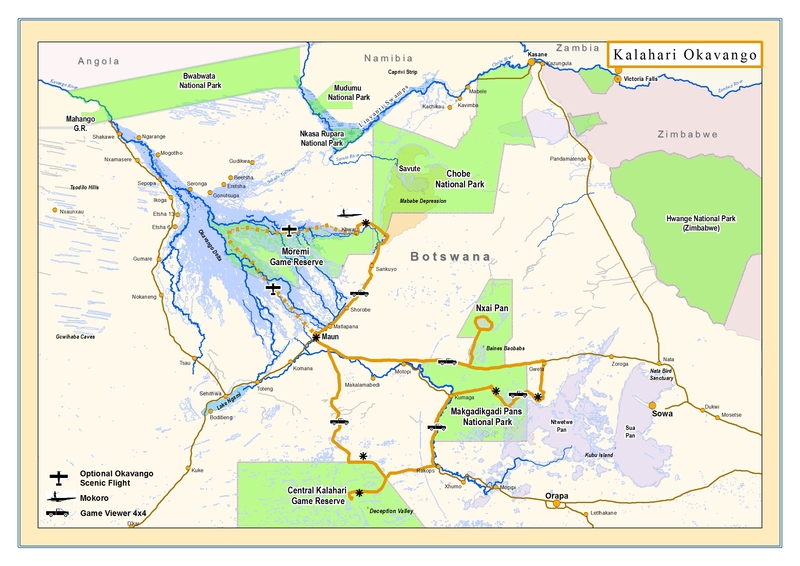 We expect to leave Maun and begin our journey around lunchtime where we head south to the Meno a Kwena Lodge on the Boteti River. We arrive mid to late afternoon. Enjoy sundowners overlooking the river on your first night in Botswana. Following an early breakfast we depart on a walk in the Kalahari with the resident San Bushmen. After a 2 hour drive we enter the CKGR and Deception Valley in time for lunch in our mobile camp. We will spend the next three nights in the CKGR. After approx. 2 hours the vegetation changes and small dry pans (open areas) appear and at one stage the land falls gradually away to Deception Valley. The valleys in the Kalahari are extinct river valleys that occurred millions of years ago and are now covered in short dry grass. After a little rainfall the grass turns green offering the wildlife much needed nutrition. We explore areas like Deception Valley, Passarge Valley, Sundays Pans and Letiahau. 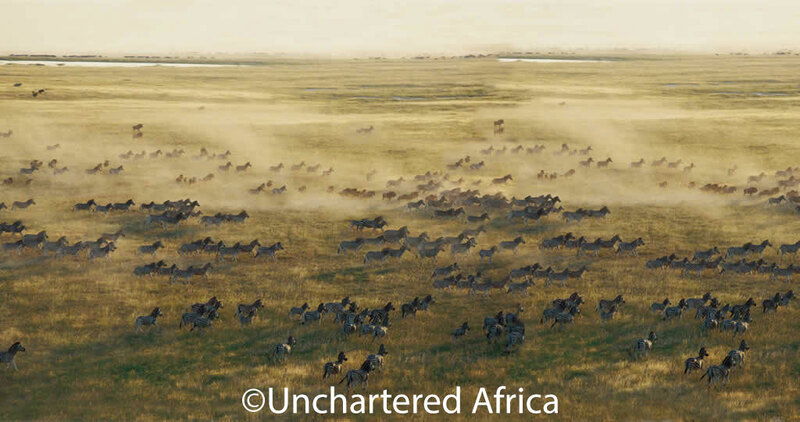 To get a better idea of this unique ecosystem we recommend you read “Cry of the Kalahari” by Mark and Delia Owens. A fiercely beautiful but hostile environment – the CKGR will creep into your soul and for many months after your visit you will yearn to return. We pack and move camp east to the huge expansive grasslands of the Makgadikgadi Pans in search of the huge numbers of zebra (up to 25000 animals) that leave the Boteti river system and concentrate on the open grasslands in search of nutritious grasses to give birth to their young. Despite their numbers they can be elusive and we spend the next two nights in search of the herds and exploring this vast open landscape. After breakfast and a short morning game drive we pack camp and head further east to Camp Kalahari in a private Concession just outside the park. 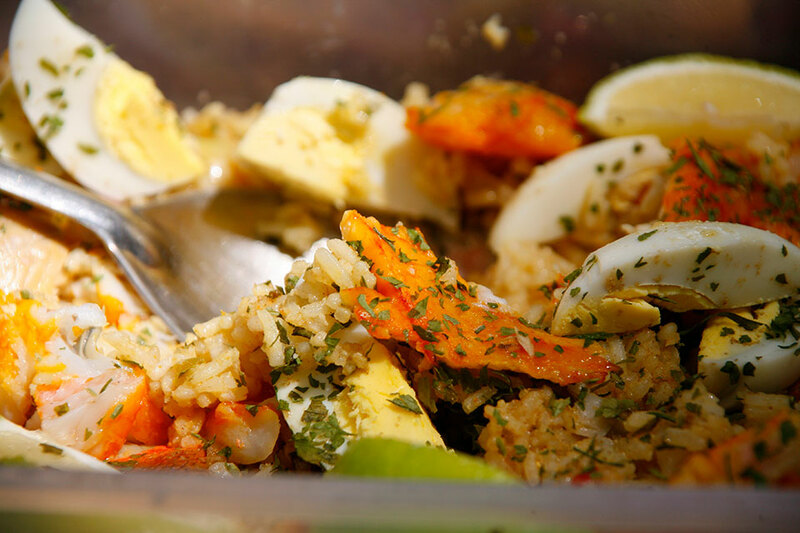 We arrive in time for lunch and you will settle into your tents at Camp Kalahari. In the afternoon we head out for a late afternoon drive in search of the meerkats. Dinner will be served at the lodge. 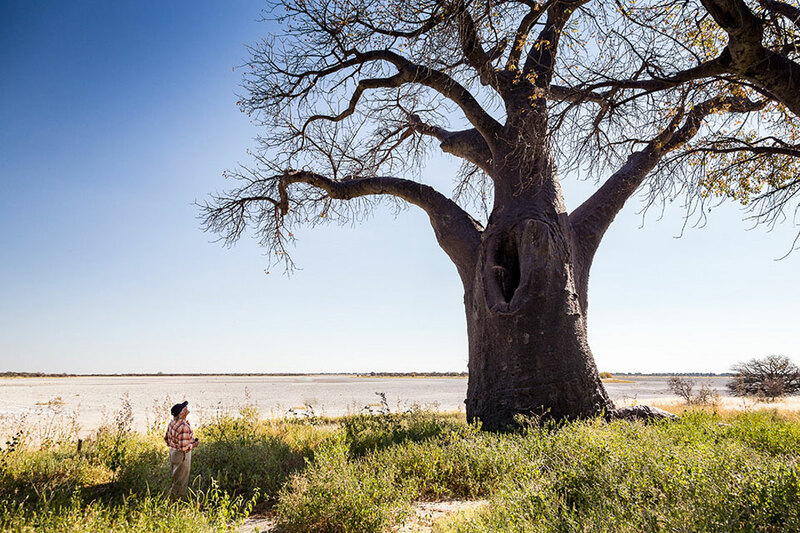 An early morning road transfer takes us from the Makgadikgadi to Maun in time for lunch at a quaint local restaurant and then a road transfer to the mobile safari camp in the Khwai area of the Moremi Game Reserve. 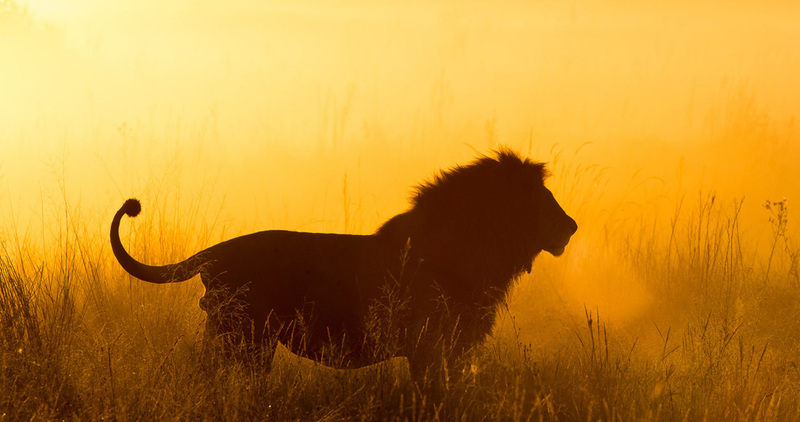 The Moremi Game Reserve forms part of the unique ecosystem called the Okavango Delta and Moremi covers up to one third of the Okavango. 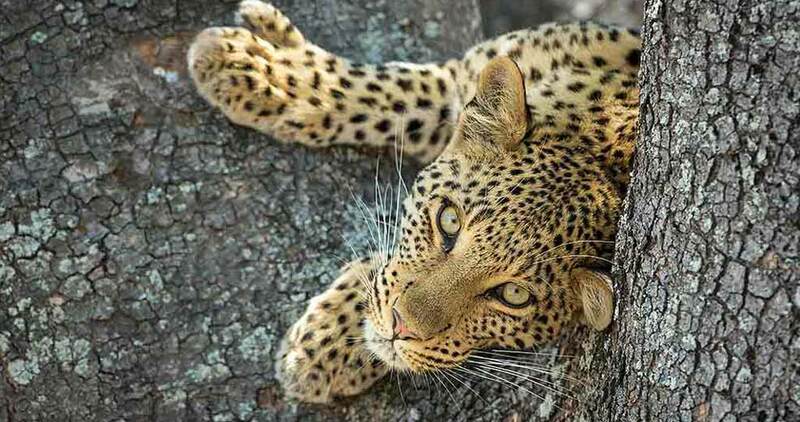 The total area of the Okavango covers up to 18 000 square kilometres of which the Moremi Game Reserve is 5000 square kilometres. We spend the next three nights camping at a campsite in the Moremi Game Reserve exploring the Khwai floodplains on game drives during the day. Experience a 2.5 hour mekoro trip exploring the waterways of Khwai which is the most eastern reach of the Okavango River system. 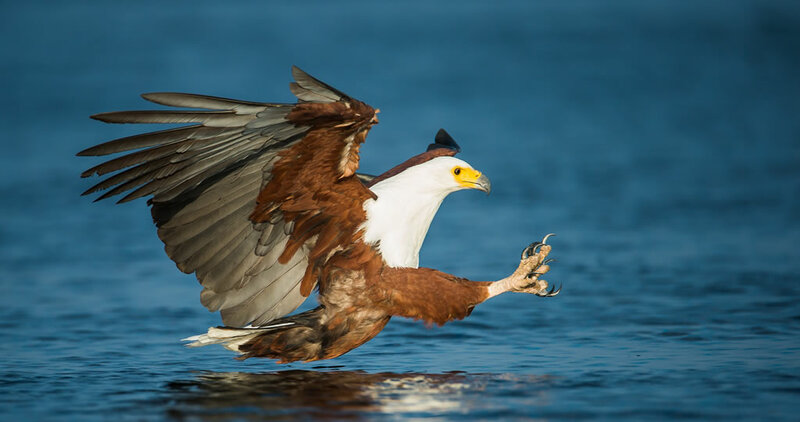 Following our customary early morning breakfast and early game drive we say goodbye to our back up team and camp staff and head for the bush airstrip to board a charter plane for a scenic flight over the Okavango Delta – this is optional and at additional cost. The route takes us from a bush airstrip over Chiefs Island for an approx. 50 min flight landing at Maun airport to connect with your onward arrangements. Alternatively accompany your guide for a road transfer back to Maun. NOTE: Although we make every effort to adhere to schedules, itineraries and activities, these are subject to change in light of changing local conditions (weather and roads) as well as availability. We reserve the right to change to a motor boat cruise subject to local conditions. You will be notified accordingly. Rates are subject to National Park increase by Botswana Government without prior notice. Most of the scenery en-route to CKGR is cattle country and dry savannah bush. After approx 5 hours the vegetation changes and small dry pans (open areas) appear and at one stage the land falls gradually away to Deception Valley. The valleys in the Kalahari are extinct river valleys that occurred millions of years ago and are now covered in short dry grass. After a little rainfall the grass turns green offering the wildlife much needed nutrition after a harsh dry winter. Most of the antelope species converge in the river valleys in search of this nutrition and also to give birth to their young. This is a purely natural wilderness with little human affect and has stayed in this condition for hundreds of years. The CKGR is known as a desert as 99% of the year there is a lack of surface water. The animals survive by getting moisture from early morning dew and from the plants they eat. 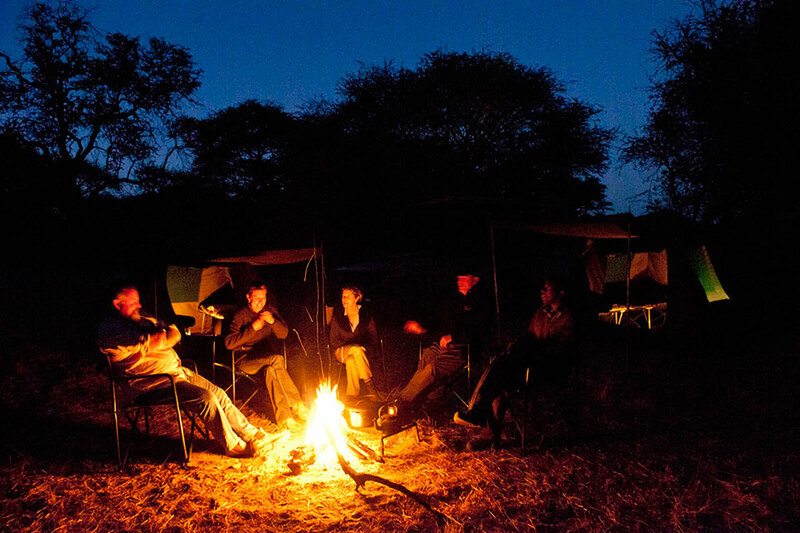 The reserve is also the ancient home of the “San” or Kalahari Bushmen. The CKGR has enormous horizons and many kilometres of seemingly endless grass plains. As the antelope converge in the valleys so the predators follow. CKGR has good populations of the famous “Kalahari lions“ and is a very good place to see Cheetah and Brown Hyena if you are very lucky. 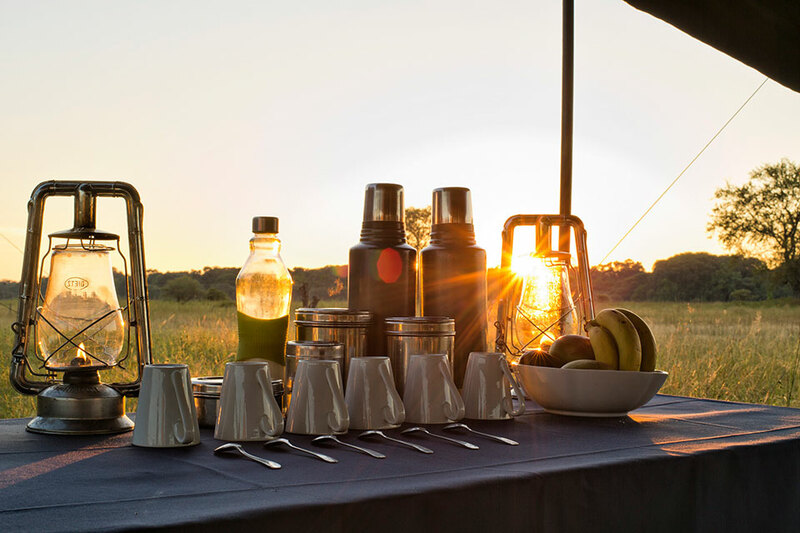 To get the best experience in the Kalahari it is advisable to leave the camp as early as 5.30 am as most of the fauna is active early and then retire to the shade in the midday heat to avoid excessive water loss. Early mornings and late afternoons are the best time to photograph this amazing landscape. To get a better idea of this unique ecosystem we recommend you read “Cry of the Kalahari” by Mark and Delia Owens. The Okavango is a unique ecosystem, an inland delta situated in the middle of the largest stretch of continuous sand in the world – the Kalahari basin. This wetland lies like an oasis in an otherwise inhospitable landscape. Where land and delta meet, a mosaic of pans, grasslands, forests and lagoons provide an extremely rich and diverse habitat in which a multitude of animals and birds flourish. This wetland is one of the natural wonders of the world, a fragile ecosystem that remains one of the world’s least spoilt and most beautiful wildernesses, and is home to various unique species e.g. sitatunga antelope and red lechwe.